Smartphone devices have truly become an extension of the human psyche. We no longer store phone numbers in our minds; they are saved in our contacts list. Many don’t care to retain trivial facts when they can simply say “OK Google” and shortly receive an answer. Our mobile devices are always close by, seldom not in use, and Google understands just how important they have become in day-to-day life for the modern masses. It is this ubiquity that led Google to implement a mobile-first initiative and focus on providing fast loading mobile content, relevant search results for mobile-based user intentions, and so forth. 2015’s Mobilegeddon was Google’s wake-up call to site owners that mobile-friendly sites are a requirement, not a luxury. The influence of mobile devices is not going to disappear, so site owners need to embrace the fact that websites must be optimized for mobile. With that said, here is your mobile SEO checklist to ensure that you rank in the small screen SERPs. Many Flash elements simply don’t render on mobile browsers, which has led to sites that leverage the technology falling in mobile rankings. Google’s mobile usability report recommends using “modern web technologies” for content, aminations, and navigation. Instead of using this outdated tech, leverage HTML5 to ensure that your content and other site elements display correctly across both desktop and mobile devices. While pop-ups are often used to capture e-mail addresses or promote things like new apps, these are best left unused on mobile websites. They are often viewed as intrusive and a nuisance to users and disrupts the UX of a site. Google has deemed these types of ads to be an interference with mobile usability and will penalize any site that allows these ads to be displayed. Viewports are a kind of meta tag which provides browsers with direction on how to manipulate page dimensions for a given device. These appear at the head of your webpage and, if no viewport tag is implemented, mobile browsers will simply render a page as it would appear on a desktop. This is clearly problematic and automatically deems your site none mobile-friendly. Google provides a tutorial for setting this up and the instructions suggest setting the viewport value as width=device-width. This enables a page to match the width of a given device. Additionally, using the value initial-scale=1 will allow a page to occupy the entire screen of the device whether it is in portrait or landscape mode. Be sure to size your content to the viewport. This is easy to do because Google as supplied a tutorial for this as well. Just do be sure to never set your viewport as a fixed value. It may render correctly on certain sized devices, but not all because there is a great variety in mobile device sizes. Granted that your viewports are properly set, text font should automatically size properly for the device. Google has a few additional recommendations to help optimize your text. Firstly, it is advised to utilize a base font of 16 pixels with vertical spacing between characters set at the browser default line-height of 1.2em. Also, try to avoid using a variety of font sizes — this will make your page appear messy and unorganized. When it comes to links and buttons on the page, understand that the human finger is much more inaccurate than a cursor and needs more room to work. If you fail to provide the appropriate amount of spacing or leverage buttons and links that are too small, prepare to be penalized by Google. The search giant also suggests utilizing buttons that are no smaller than 7mm (48 pixels) wide to prevent other elements from getting tapped accidentally. The space surrounding each button should be no smaller than 5mm. Whether you are trying to rank on desktop or mobile, content is one of the best ways to do it. Content on mobile, however, is a bit different than on desktop. Keywords are, of course, necessary in mobile content but, when compared to desktop, there are discrepancies in density. According to a recent Searchmetrics report of top ranking mobile results, keyword density on the small screen (5.48 keywords) is about half of that on larger screens (10.22 keywords). The same study showed that the average word count on mobile (868) is significantly less than desktop (1,285). This means that mobile content should be shorter, considering that screen sizes are not ideal for deep research, yet still long enough to thoroughly cover a subject. Content images show a similar pattern — the average image count on desktops comes in at around nine, whereas mobile clocks in at less than four. This likely correlates with an effort to keep page load speeds high, because a slow site will also be penalized by Google and likely abandoned by the visitor. In addition to these stark contrasts between mobile and desktop, the study suggests that the importance of inbound links may be declining on mobile due to the fact that content is more typically shared on social media than through direct links. 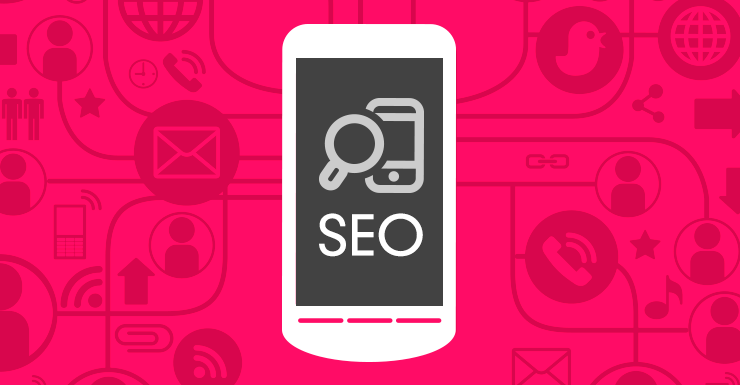 There are still other, more typical and well-known mobile SEO practices to abide by, but this checklist should have your site ready to rumble with any competitor in the mobile SERPs.